A 2018 Tile Pro can be used for years now that the battery can be swapped out. For much too long, the best key finder had a significant flaw. A Tile Pro or Tile Mate helps you keep track of your keys, the remote, or other items, but each only lasts a year. Then you have to buy another one because the battery can’t be replaced. That finally changes in the new 2018 version. Plus they have a greater range. We tested the latest versions of the regular and Pro versions of the Tile tracker to see if they live up to their promises. A Tile tracker can be a real lifesaver. Rather than search your house for your keys or the TV remote, you just ping the Tile you’ve attached to the lost item from your phone. Tile, Inc. has been around for years, gradually improving its products. The 2018 models are far-and-away the best it’s ever made. They have greater range and louder speakers, but the most significant improvement is replaceable batteries. The exterior of these accessories hasn’t changed much, though. The more-expensive Tile Pro is a 1.65-inch (42mm) square with a nicely professional-looking appearance. The Tile Mate is a 1.38 inch (35mm) square that’s more functional than attractive. They’re just small enough to be worth attaching to most items you frequently misplace. Keys are the most obvious, choice but consider your whole purse, or perhaps a coffee mug. Unfortunately, neither Tile is small enough to be clipped to a pair of glasses/sunglasses. Both Mate and Pro are rated for IP55 water and dust resistance. In layman’s terms, that means they can get rained on or dirty without failing. But don’t take one swimming. The Tile Mate doesn’t’ look as nice as the Pro, but it’s still functional. No matter the version, pressing a large button on the front lets a Tile do the opposite job: it will ring your phone. As long as you know where either your keys or your phone is, you can always find the other. On the back of each of the 2018 models is a small door. Sliding this open easily reveals the replaceable battery that’s such an improvement in this latest generation trackers. 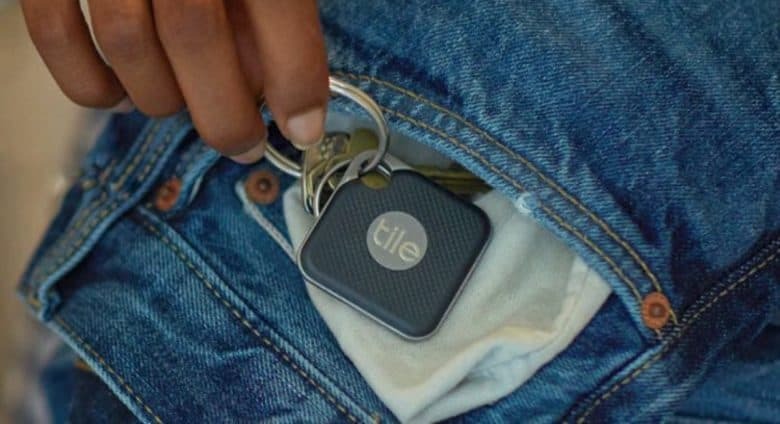 Tile, Inc. promises that each battery will last a year. Naturally, we can’t test that. But we can say that replacements are cheap: between $1 and $1.30 each. However, almost every advancement brings drawbacks. The new battery door is a potential weakness, as it might inadvertently come open, rendering the Tile useless. We put our test Tiles through some abuse and never had that happen, but it’s something to be aware of. One of the major improvements of the 2018 Tile models is range. The manufacturer says its newest Pro version is detectable at 300 feet, but in our straight-line test we were able to find and set it off at about 500 feet. The cheaper 2018 Tile Mate is rated for 150 ft. but we were able to reach it at roughly 250 ft. before the signal stated becoming unreliable. Both tests were done with no obstructions. But that’s not particularly realistic, so we put both Tile versions in a pants pocket, in a closet, in a closed bedroom, and went to the other end of the house. Both could be found, though the Tile Pro maintained a solid connection and the Mate just an intermittent one. Next we put the trackers in a purse in that same closed room and went back to the other side of the house. Again, were were able to connect to both. That’s when staying on the same floor of the house. Changing floors reduced the distance quite a bit, but the Tile could still be located when we were in the room directly above or below it. Be aware, all the tests for this Tile Pro and Tile Mate review were conducted with an iPhone XS Max. Another phone might have shorter Bluetooth range. That’s how the phone and finder communicate, not over Wi-Fi. Another highlight of the 2018 lineup is ringer volume. The latest Tile Pro is loud. We could hear it clearly during the test when we were able to set off the alarm from 500 feet away. We can also hear it from halfway across the house when that Tile is in the bottom of a purse. The Tile Mate isn’t that noisy, but we never had a problem hearing it as long as it’s somewhere in the room with us. A great new feature that’s not limited to the 2018 models is Siri support. 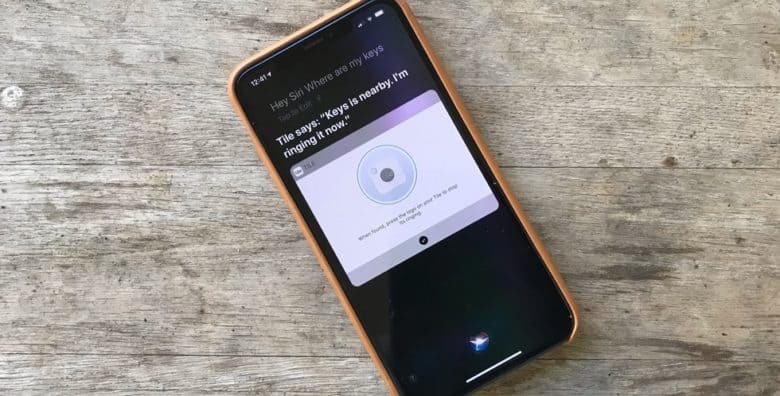 You can now tell your iPhone “Hey Siri, where are my keys?” to have a tracker start ringing. Unfortunately, this feature isn’t 100 percent reliable yet. A couple of times Siri told us it was ringing the Tile but nothing was actually happening. Or we were told we’d left the Tile at work when it was in the next room. That never happened with the Tile application. Siri integration into the Tile application lets you find your keys by just asking for them. Another nifty feature is Smart Alerts which go off if you leave a location without a tracker. This requires the new Tile Premium subscription service, though, which is $29.99 annually or $2.99 monthly. Plenty of people considered getting a Tile but then reconsidered after finding out it becomes useless after about 12 months. But that huge limitation is finally gone. You can get a tracker and keep it for years. That’s important considering the Tile Pro is $35 and a Tile Mate is $25. They’re available in 4-packs at a discount if you want to supply the family. Neither of these trackers are cheap, but they’re the best we’ve tried. The 2018 Tile models have much greater range than any other key finder we’ve used, and can really save your bacon when you’re trying to figure out where your teenager left your car keys. Or find the TV remote behind the couch. Tile provided Cult of Mac with a review unit for this article. See our reviews policy, and check out more stuff we recommend.